Slice the zuchinni and dice the tomato. Put it in a pot. Add corn. Put cheese last. Salt and pepper to taste. Hello! Here's a great way to use up all of those zucchini you've got laying around! I often double this recipe and make two 9x13 pans. It doesn't last long in my house! Enjoy!! This recipe can make two (2) 8x4 inch loaf pan loaves or you can make it in a 9x13 pan for "brownie style". 4. Bake for 50-60 minutes or until a toothpick comes out clean. Anything with "brownie" in the title has to be good. :) Thanks! My computer is fussy tonight and won't let me link. But my newest favorite easy easy zucchini recipe is from Smitten Kitchen. I link to it on my blog if you can't find it on hers. Basically it's a stirfryish thing--brown some sliced almonds, then toss in zucchini to heat through, serve with salt, pepper, and parm if you feel like it. Slicing the zucchini is the hardest part, and it's really tasty. I also adore a corn/zucchini/tomato bake, also linked on my blog. I don't mean to make you click over but I keep losing my post when I try to do links, and I feel like I owe you since I've gotten such great recipes from you! Pre-cook (in microwave or on stove-top) the zucchini and onion in very little water until just tender; drain. (You may not need any added water if cooking in microwave). Mix soup and sour cream; fold in raw carrot, zucchini and onion. Melt butter and mix with stuffing. Spread half the stuffing in bottom of a 2 qt. baking dish. Spoon zucchini mixture on top. Sprinkle with remaining stuffing. Bake in a moderate oven until golden brown and bubbly. 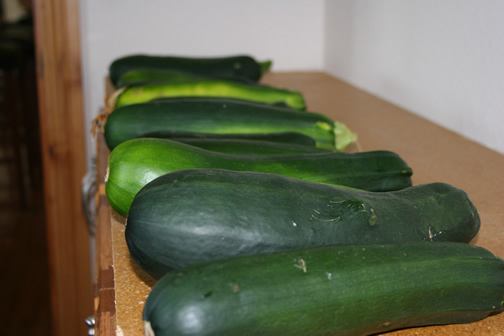 Makes a great side dish and uses up a lot of zucchini! P.S. If you can only find cubed stuffing, crush slightly. Thanks for the recipes ideas, ladies. Carol Ann, that casserole sounds yummy!